I had Catalan Tomato Bread before I ever tasted peanut butter and jelly on crustless white bread. My parents had emigrated from Catalonia, Spain to Maine where I was born and had brought the flavors of the home country with them. By the time I was four I had developed a discerning palate for this simple combination of ripe tomatoes, garlic and olive oil that I have managed to pass on to my own children. When I wrote The Wonder Singer and set the early years of my Diva in Barcelona and nearby villages, I found that the food of the region needed to be a part of the sense of place that I would bring to readers. And nothing says Catalonia more deliciously than Pa Amb Tomàquet. The recipe that follows comes from Gourmet magazine and proves how this simple process adds up to much more than the sum of its parts. The magic of its flavors comes from choice ingredients – the best tomatoes that money can buy, fresh garlic, sea salt, extra-virgin olive oil. The other secret is about process. This is a hands-on ritual. The tomatoes are not chopped or blended or pureed. The pulp from a half tomato must be rubbed by hand into the grilled bread. The same with the garlic. The olive oil must be drizzled generously until the crusty baguette slice glistens as if under the Mediterranean sun. Enjoy with grilled foods, traditional potato omelet (recipe on request) or fish dishes. This is food to sing home about. Pa Amb Tomàquet is the aria of Catalan comfort food. Rustic and assertive, Pa Amb Tomàquet is a quick and easy hors d’oeuvre or accompaniment, best grilled (and served) in batches. Prepare grill for cooking. If using a charcoal grill, open vents on bottom of grill, then light charcoal. Charcoal fire is medium-hot when you can hold your hand 5 inches above rack for 3 to 4 seconds. If using a gas grill, preheat burners on high, covered, 10 minutes, then reduce heat to moderate. Broiler and toaster-oven work fine too. Cut bread into 3/4-inch-thick slices (cut baguette on a long diagonal for 6-inch-long slices). Working in batches of 3 or 4 slices, grill bread on lightly oiled grill rack, covered only if using a gas grill, turning over once, until grill marks appear, 1 to 2 minutes total per batch. 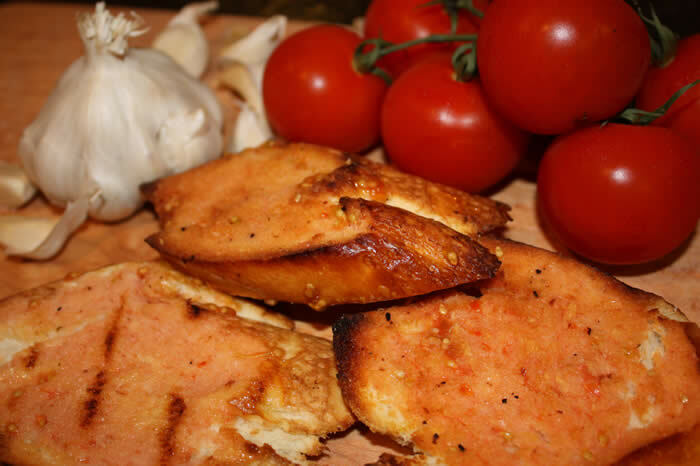 Remove bread from heat and immediately rub 1 side of each slice with cut side of a garlic half, then rub with cut side of a tomato half, using 1 tomato half for 1 to 2 slices of bread and allowing most of pulp to be absorbed by bread (discard remainder of garlic and tomato halves). Brush bread with oil, then sprinkle with salt and serve immediately.